"Light and fluffy and the closest thing I've found to my grandmother's biscuits. Delicious for jams, butter, honey, corn syrup, or just great bread for any meal. My grandmother used to make them pretty much every day." Preheat oven to 450 degrees F (230 degrees C). Lightly grease a baking sheet with 1/2 teaspoon of lard. Mix together the flour, salt, baking soda, and baking powder in a bowl. Grate the frozen butter and 2 tablespoons frozen lard into the flour mixture with a cheese grater; stir lightly 1 or 2 times to mix. With your fingers, make a well in the middle of the flour mixture, and pour the bacon drippings and buttermilk into the well. With just the tips of your fingers, stir lightly and quickly to just bring the dough together before the butter and lard melt. Dough will be sticky. Scrape dough out onto a floured surface, and gently pat the dough flat. Sprinkle the top of the dough with flour, and fold it in half; pat down, fold again, and repeat until you have folded the dough 4 or 5 times. With a rolling pin, roll the dough out to a square about 1 inch thick. Cut the biscuit dough into rounds with a 2 1/2-inch biscuit cutter or the floured edge of a drinking glass by pushing straight down (twisting the cutter will seal the edge and keep the biscuits from rising). Lay the biscuits onto the prepared baking sheet so the edges just touch. Bake in the preheated oven until risen and lightly golden brown, 15 to 20 minutes. 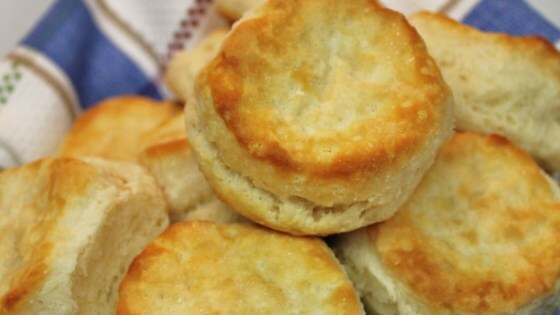 A true take on a southern style biscuit. these were ok for me im sorry grandmas angel biscuits just cant be beat now if i could just find the recipe for them! Just made these tonight, all I can say is, they turned out PERFECT. Thank you for the recipe, I changed NOTHING!